ECB Rate Capping: Will Traders Call Their Bluff? The European Central Bank is considering setting limits on yields of euro area sovereign debt by pledging unlimited bond purchases, Germany’s Spiegel magazine reported without saying where it obtained the information. The policy will be decided at the September meeting of the ECB’s governing council, Spiegel said. With the PIIGS sovereign bond yields rising to unsustainable levels (See Chart Below), it is understandable why ECB resorts to this “big bazooka” plan partly making good on ECB President Draghi’s bold promise to do “whatever it takes” to save euro. However, it also demonstrates how the Euro Zone seems to be at its wit’s end to effectively restore market confidence. Instead of simply a problem of higher bond yield, central to this crisis is PIIGS nations have had years of excessive spending relative to revenues. If these debt-problematic countries have control of their own currency, then they might be able to follow the debt restructuring model such as Argentine to slowly dig themselves out of the hole. However, this is not the case for the Euro Zone. This sugar-pill proposal of “unlimited bond purchases,” if implemented, will most likely relieve the rate pressure in the short term, but the rudimentary issue is that the Euro Zone is nowhere near making these PIIGS countries to really commit to getting spending under control. 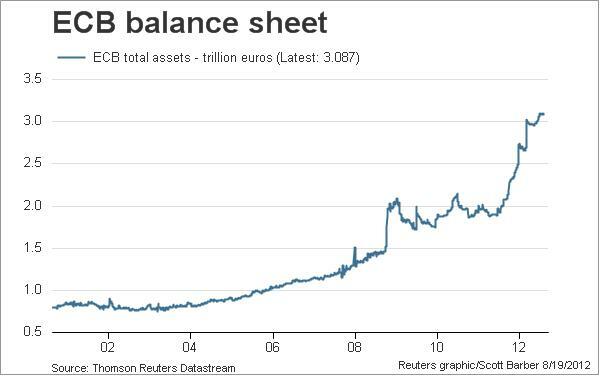 Now, ECB’s balance sheet has ballooned to 3.087 trillion euros, or USD $3.8 trillion (See Chart Above), so the more important question is how much longer can ECB keep this bond buying spree? ECB would continue wasting good money (ultimately from the European taxpayers) on bad “solutions,” instead putting into promoting GDP growth. Even if PIIGS countries come to agreements on austerity measures, that would still take a decade before any meaningful signs of recovery. Europe would be pushed deeper into a recession or even a depression. 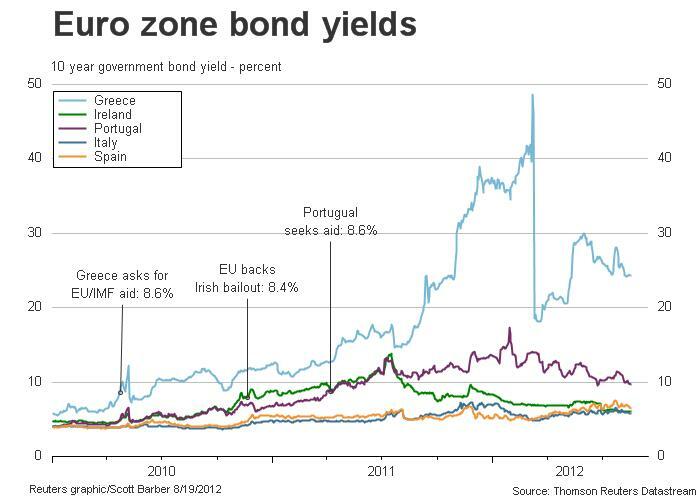 Since the Euro Zone is bound by a single currency, the member countries in the zone sink or swim together. Market fears of the bloc’s difficulties have prompted Moody’s to threaten cutting the hard working and earning Germany’s AAA sovereign credit rating.For now, the Euro Zone will try to stay together for as long as they can. Kicking the can down the road is one thing world politicians love to do until it blows up in their faces, and that’s when everything hits the fan– fast and furious.